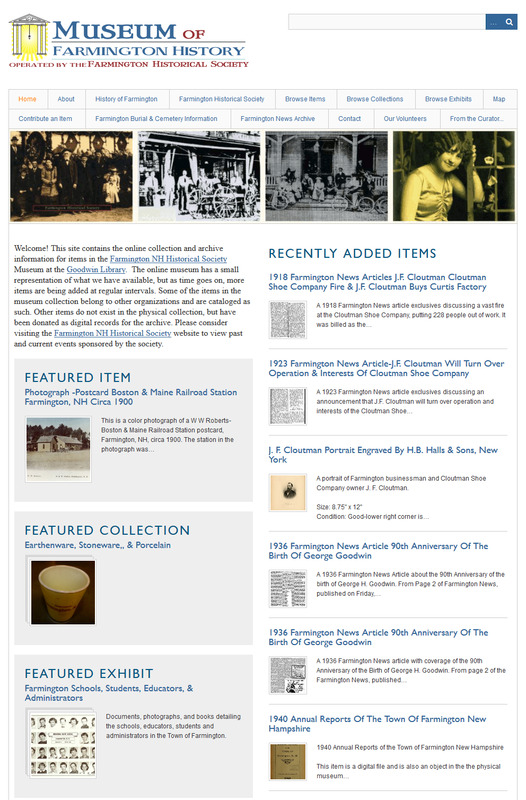 Two of the most important purchases we made this year were made from a regional antiquarian document dealer. 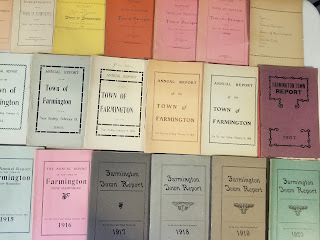 After viewing the items made available from the dealer, we were able to obtain a Farmington Woman's Club book, pictured to the left and an assorted group of ledgers from notable figures in Farmington's past, and bring them back to our town, where they belong. 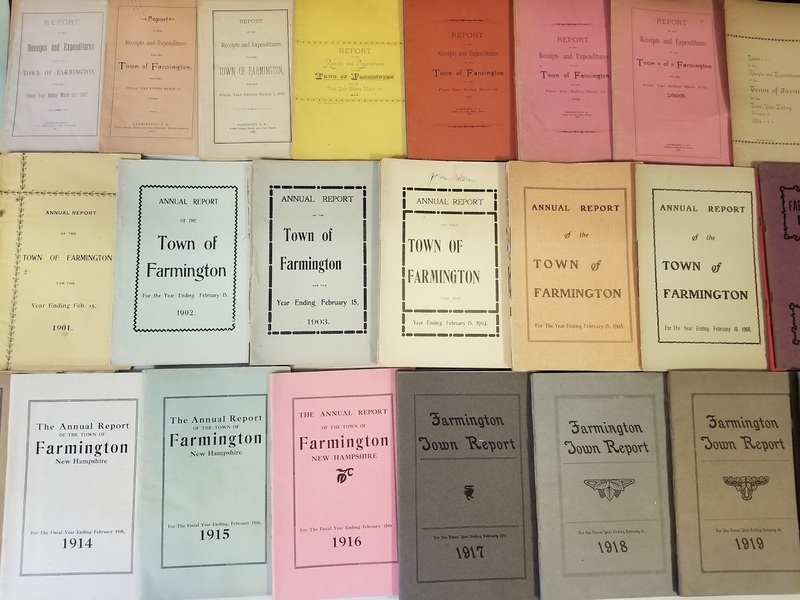 The Farmington Woman's Club book is in excellent condition and contains many accounts and details from a single year in the history of the club, 1924-1925. 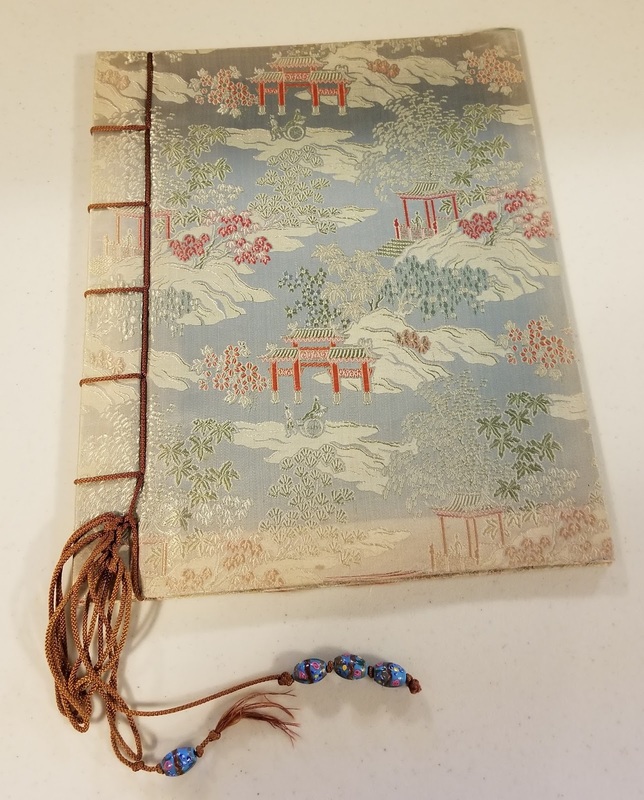 The ledgers are also in good condition and give a peek into saving, purchasing, and spending habits, as well as a few financial notes. We were also able to secure an almost complete collection of town reports from the 1870's to the mid 1950's. 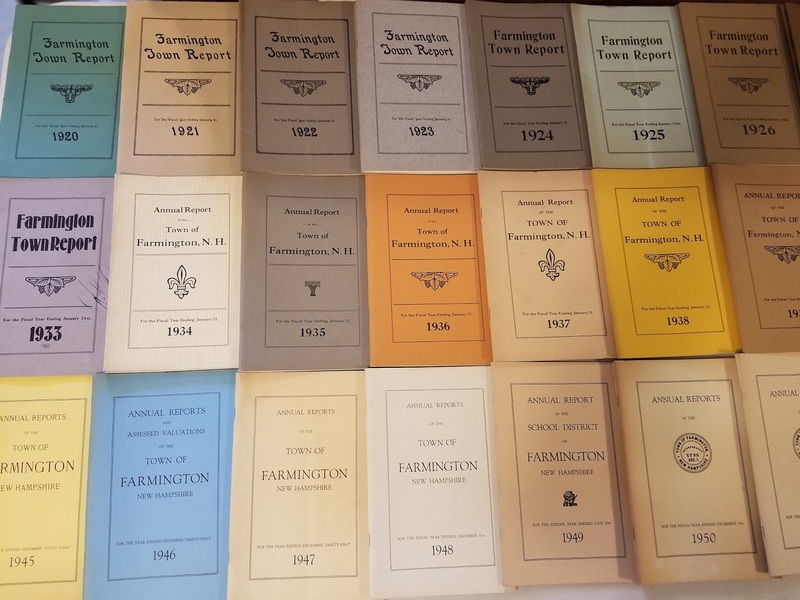 We've had some town reports filter in over the years, but nothing that even approached a complete decade, much less three quarters of a century. They are varied in look, color, size, and content, but more importantly contain information such as marriages, births, and deaths, which can be helpful facts when piecing together genealogical stories, family trees, and cross checking historical details. 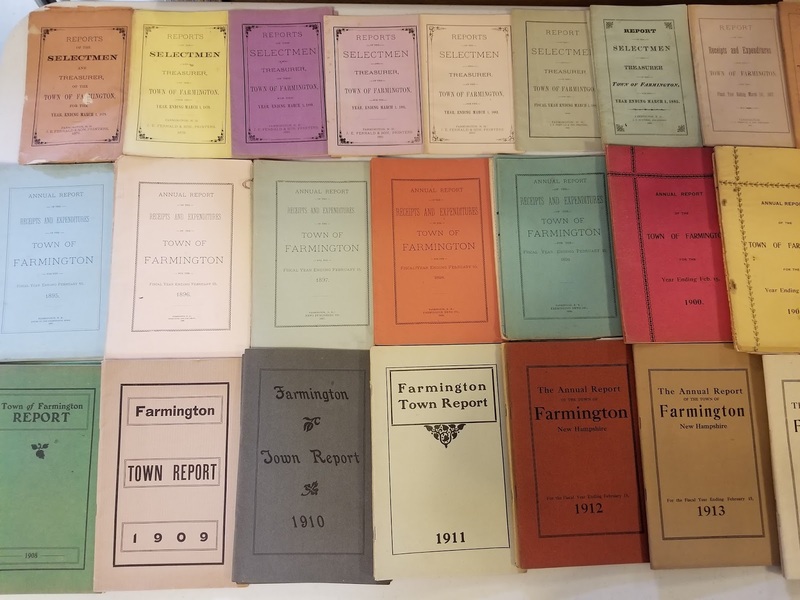 Since most of our town records, and everything in our library at the time, perished in the horrible fire that burned down the Farmington Opera House in 1928, this is a significant contribution to our historical record. 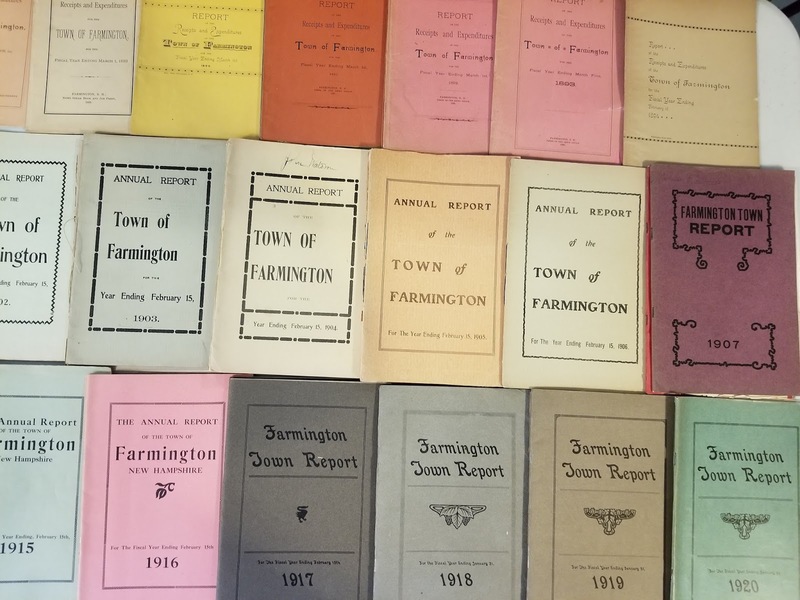 In addition to these purchases, we also found that the University of New Hampshire has made available digital copies of Farmington town reports from the 1950's to the present. 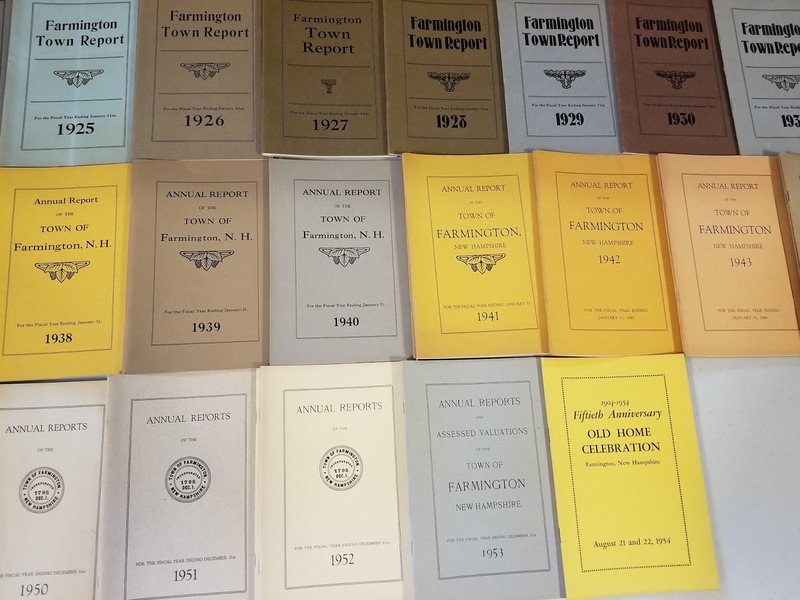 This means that one can view reports from the mid nineteenth century all the way through the early twenty-first century with ease. 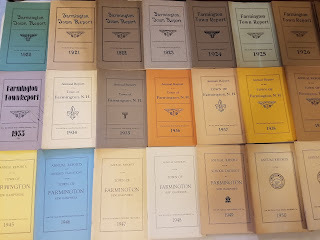 I keep my eyes open for all such opportunities, but this cache at a regional dealer didn't get my attention until a marvelous resident told me it was available. 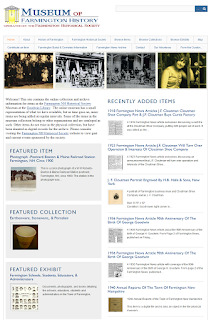 I encourage all of you to contact us when you find items for possible inclusion in our growing historical collection. 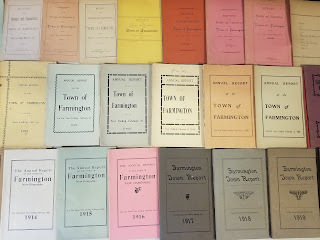 Contact me at farmingtonnhhistory@gmail.com with items you would like us to consider.